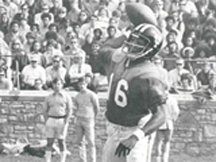 WGTE looks at the history and the legacy of the '60s and '70s through the inspiring life of UT Quarterback Chuck Ealey. Experience the joys and the highs, the electricity and the love, the pains and the sorrows, the perseverance and fight for equality. Take a journey with us, Chuck Ealey and his UT Rocket football team members as we travel from Portsmouth Notre Dame High School in southern Ohio to the University of Toledo and on to the Canadian Football League.